This is a joint post by David Morrison and Ajith Harish. David Quammen. 2018. Simon & Schuster. The book is intended for the general public, rather than for specialists, explaining the "new view" of evolutionary history that includes extensive horizontal gene transfer (HGT), especially in the microbial world. Quammen describes himself as a science, nature and travel writer, so his book is more than just a record of science, and is as much about the people involved as about the scientific theory. In particular, it contains a biography of Carl Woese. 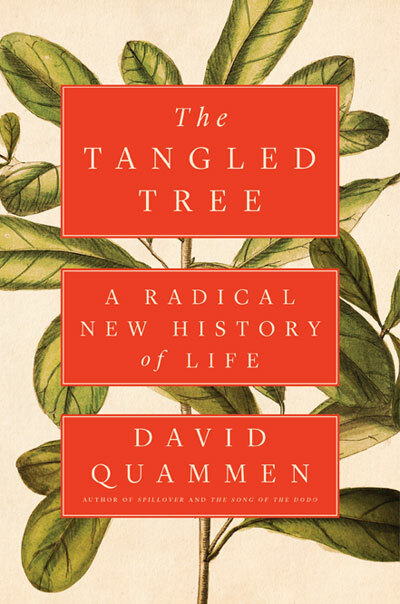 Quammen’s recent New York Times feature article The scientist who scrambled Darwin’s Tree of Life is a very good primer to his book. For us, it indicates that the book has many overlaps with Jan Sapp's earlier book The New Foundations of Evolution: on the Tree of Life (2009. Oxford University Press). The publisher’s advertised selling point of that book is: "This is the first book on (and first history of) microbial evolutionary biology, and that it puts forth a new theory of evolution", with HGT being the new theory. In this sense, the "radical new view" is simply that genetic material can be transferred without sexual reproduction, an idea that goes back rather a long way in history (see The history of HGT), and which is often seen as anti-Darwinian. Bill Hanage in his review of Sapp’s book (2010. The trouble with trees. Science 327: 645-646) argues that the book neither puts forward a new theory nor is the debate actually about horizontal gene transfer, and the Tree of Life is thus far from settled. There are many other interesting points discussed in that review. Furthermore, even after almost 10 years, Hanage’s review of Sapp’s 2009 book can be substituted verbatim as a review of Quammen’s 2018 book! This PDF shows how the book review would read if the author and book names in Hanage’s review were to be substituted [reproduced with the permission of the original author]. The debate allegedly involving HGT is, at heart, about explaining the pattern of extensively mixed genetic material found in the akaryotes. However, simply looking at a pattern does not tell you about the process that created the pattern. In order to study processes, we need a model, in this case a model about how evolution occurs. The "HGT model" is that the Last Universal Common Ancestor (LUCA) of life was a relatively simple organism genetically, and that subsequent evolutionary history has involved complexification of that ancestor, both by diversification and by HGT. What the two books do not explore is the other major model for the current distribution of genetic material among akaryotes. This alternative scenario is that the LUCA was genetically complex, and that the subsequent evolutionary history involved independent losses of parts of the genetic material — the sporadically shared material is basically coincidental. All that this model requires is that there be evolutionary history prior to the LUCA, during which it became a complex organism from its simple beginnings — the LUCA is merely as far back as we can see into the past, with the prior history being unrecoverable by us (ie. we cannot see past the LUCA bottleneck). Anthony Poole, Daniel Jeffares, David Penny (1999) Early evolution: prokaryotes, the new kids on the block. BioEssays 21: 880-889. Christos A. Ouzounis, Victor Kunin, Nikos Darzentas, Leon Goldovsky (2006) A minimal estimate for the gene content of the last universal common ancestor — exobiology from a terrestrial perspective. Research in Microbiology 157: 57-68. Miklós Csűrös István Miklós (2009) Streamlining and large ancestral genomes in Archaea inferred with a phylogenetic birth-and-death model. Molecular Biology and Evolution 26: 2087-2095. Kyung Mo Kim, Gustavo Caetano-Anollés (2011) The proteomic complexity and rise of the primordial ancestor of diversified life. BMC Evolutionary Biology 11: 140. Ajith Harish, Charles G. Kurland (2017) Akaryotes and Eukaryotes are independent descendants of a universal common ancestor. Biochimie 138: 168-183. Finally, even from the perspective of phylogenetic networks, Quammen's book is very one-sided. In particular, the other processes that lead to reticulate evolution (eg. introgression and hybridization) are pretty much ignored. That is, the focus is on akaryotes not eukaryotes. The latter are also of phylogenetic interest.